Prof B. K. Kuthiala, Chairperson, Haryana State Higher Education Council delivered a lecture on “Communication Ecosystem: Socio-Media Perspective” at the 54th Panjab University Colloquium at Dr. S. S Bhatnagar UICET, Auditorium of PU, Chandigarh. Prof. (Dr.) Raj Kumar, Vice Chancellor, Panjab University, Chandigarh presided over the occasion. 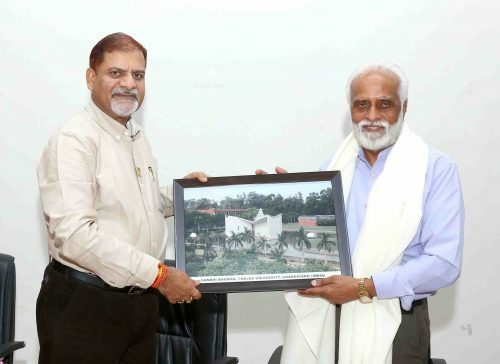 He thanked the Prof B. K. Kuthiala, Chairperson, Haryana State Higher Education Council for giving time from his busy schedule to grace the University. Prof B. K. Kuthiala explained the journey of human communication and relationships from isolated groups to global village to Vasudhaiva Kutumbakam; Structural and functional characteristics of media; Social media-Nagarjuna’s postulation; Indra’s Net; Spiritual communication; IoT and beyond; and Right to be erased. Finally, he explained the relevance of how media of communication affects human perception, understanding, feeling, and value; and how our interaction with media facilitates or impedes our chances of survival and imposes on us, the human beings, certain ways of thinking, feeling, and behaving. He also quoted that communication is not essential socially, physically or economically but is relevant biologically and that history of communication dates back to the time a human baby is born and continues starting from his growth until the last stage of his or her life. He also phrased that “You cannot not communicate” which implies that there is a hidden art of communication even in the acts of no communication and that no response by an individual also communicates a thought or a response. The overall centre of the lecture revolved around the idea that the innovations and technologies that are brought into the society by human beings are just a vital extension of the desires they exhibit due to the limitations faced by their own body. Prof. (Dr.) Raj Kumar also highlighted the achievements of university, which has been recognized by Atal Rankings of Institutions on Innovation Achievement (ARIIA),2019 known to encourage high quality research, innovation and entrepreneurship at 9th position amongst top 10 government institutes taking a place along with the leading IIT’s of our country and department of University Institute of the Pharmaceutical Sciences ,PU secured 2nd rank in the list of top pharmacy institutes of the country given by National Institute Ranking Framework (NIRF), 2019. Prof. Promila Pathak, Coordinator PU Colloquium Series briefly spoke about the eminent speaker. She introduced him as PU Alumnus and mentioned his achievements stating that has served as Chairman, Higher Education Review Committee, Haryana, Vice Chancellor (8+ years) at MC National University of Journalism & Communication, Bhopal; Director Public Relations, Dean (3 faculties), Head of the department (9 departments) and Proctor. He has around 11 international research papers, 76+ national research papers, 400+ popular articles and has edited 18 books. He has several recognitions and awards in the field of literature such as Chanakya Award, Vedic Ratna Award, Guru Shreshtha Award, Print Ratna Award, Sarvasreshtha Sancharak Award, and National Educational Leadership Award. He continues to contribute regularly in English and Hindi newspapers, produces, anchors and participates in regional and national radio and television programmes. He has also been a Consultant for newspapers, television channels, advertising agencies, and many academic organizations of higher and professional education and is associated actively with UPSC, UGC, IGNOU, NCERT and with many universities and institutes of higher learning. 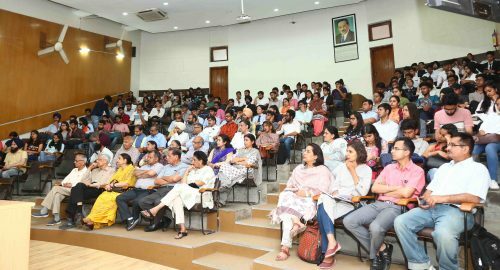 University Faculty, teachers of Local Colleges and neighboring institutes, CRIKC members, research scholars, and students attended the lecture. The event ended successfully by a vote of thanks proposed by Dr. Shruti Bedi, member Colloquium Committee.